You can use the AutoCorrect feature to correct typos and misspelled words, as well as to insert symbols and other pieces of text. AutoCorrect is automatically configured with a list of typical misspellings and symbols, but you can modify this list to suit your documents. AutoCorrect can also correct a misspelled word if the word is similar to a word in the main dictionary of the spelling checker. For more information, see Automatically correct spelling with words from the main dictionary. Text in hyperlinks is not automatically corrected. Automatically detect and correct typos and misspelled words For example, if you type teh, followed by a space, AutoCorrect replaces what you typed with the. Or if you type This is theh ouse, followed by a space, AutoCorrect replaces what you typed with This is the house. Quickly insert symbols For example, when you type (c), AutoCorrect inserts © as a replacement. If AutoCorrect does not already insert a symbol that you want, you can add it to the list so that it does. Quickly insert any long pieces of text For example, if you need to repeatedly enter a phrase, such as return on investment, you can configure AutoCorrect to automatically insert the phrase when you type something shorter, such as roi. All of these uses of AutoCorrect are supported by two parallel lists of words or symbols. In the first column is the word or symbols that you type, and the second column is the word, phrase, or symbols that AutoCorrect inserts as a replacement. Note: The AutoCorrect list is globally effective across Microsoft Office programs that support AutoCorrect, which means that when you add or delete a word from the list in one Office program, the other Office programs are also affected. 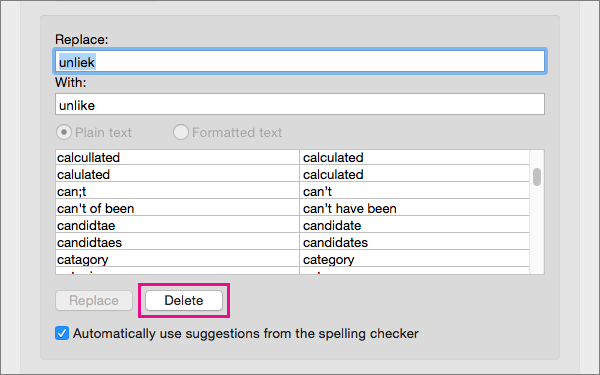 You can add a misspelled word or set of symbols that you want AutoCorrect to automatically replace with a correctly spelled word, a phrase, or a symbol that you specify. Use the following procedure to do this. On the AutoCorrect tab, verify that Replace text as you type is selected. 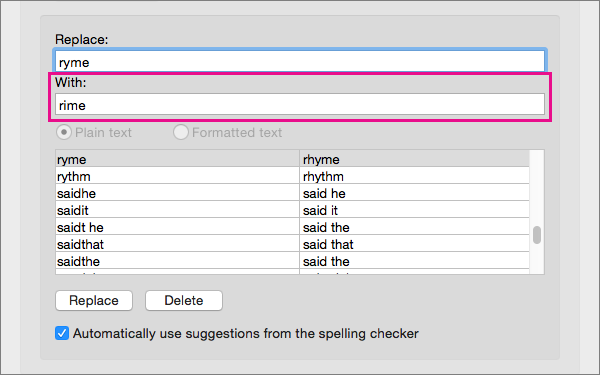 The following procedure describes how to modify the text that AutoCorrect inserts as a replacement for a specific misspelled word. 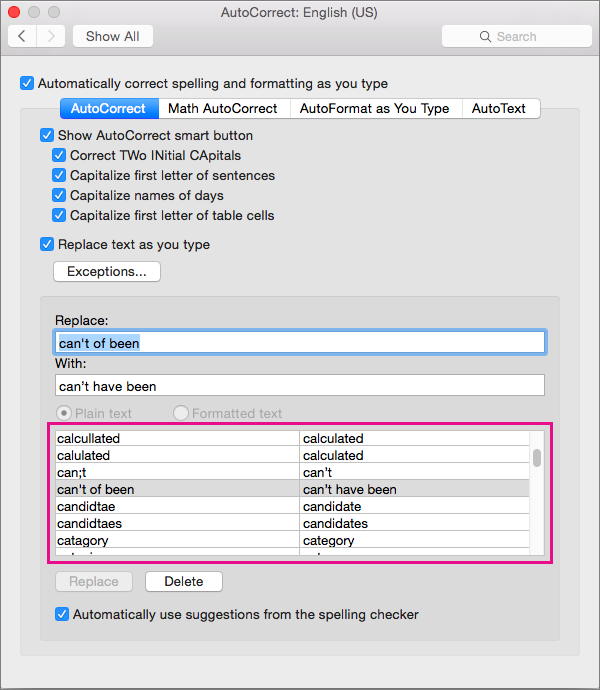 If you want to change the correction that AutoCorrect applies to a specific misspelling, use this procedure. On the AutoCorrect tab, make sure that Replace text as you type is selected. Select the entry in the list that you want to change. Word displays the entry's contents in the Replace and With boxes. Type new text in With box. 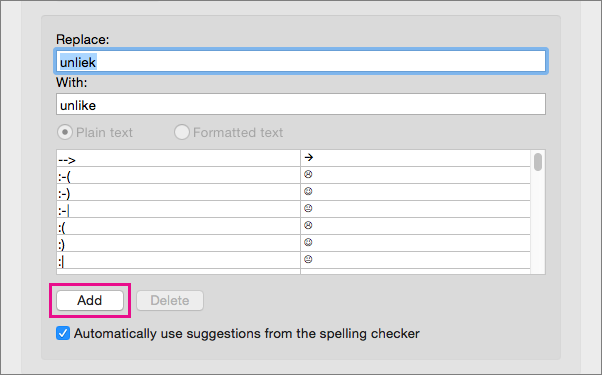 The following procedure describes how to modify the text that AutoCorrect identifies as a misspelled word. 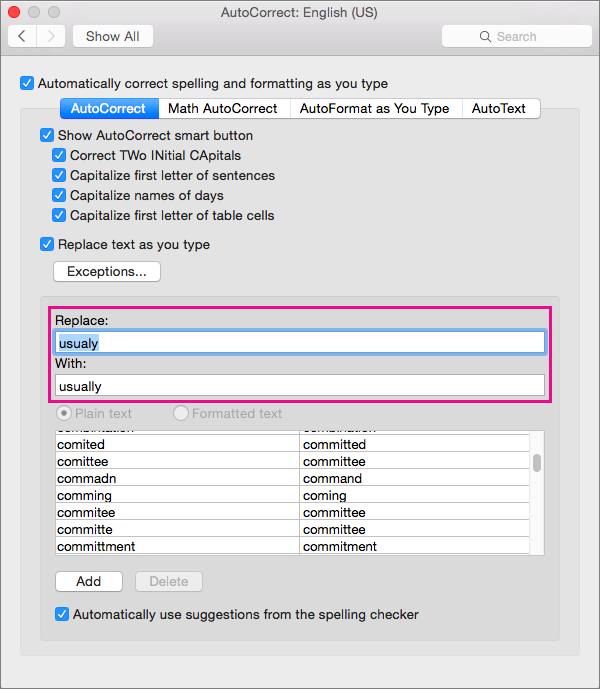 If you want to change the misspelled word that AutoCorrect applies a specific correction to, use this procedure. Word leaves the entry's values in the Replace and With boxes, so that you can make changes to them. Type a new name in the Replace box.